Australia’s new High Commissioner to Fiji, John Feakes, officially presented his credentials yesterday to President Major-General (Ret’d) Jioji Konrote. 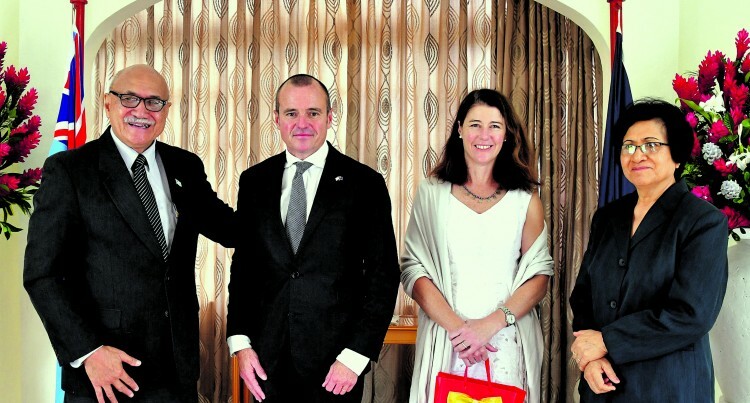 Mr Feakes and his wife, Alison, were welcomed at Borron House by President Konrote and First Lady Sarote Konrote. Mr Feakes said he was honoured to represent Australia in Fiji adding that he had arrived at “an exciting time when relations between Australia and Fiji were growing strongly”. “Trade, tourism, development co-operation, defence, disaster response, climate change, seasonal workers – there are so many areas where we co-operate and I look forward to working with the Government of Fiji and Australia’s many friends in Fiji to further strengthen the relationship,” Mr Feakes said. Australia and Fiji share an enduring friendship, underpinned by strong people-to-people links. Over 65,000 Fijians live in Australia and more than 360,000 Australians visit Fiji annually. Australia is also one of Fiji’s most significant economic partners with two-way goods and services trade showing steady increase year-on-year, totalling $2.77 billion in 2016. Additionally, Australia is one of Fiji’s largest bilateral aid donors, providing over $118 million in development assistance in 2016-17, including our ongoing response to Tropical Cyclone Winston. Australia also provided over $9 million to Fiji for its Presidency of the 23rd Conference of Parties of the United Nations Framework Convention on Climate Change (COP23). Mr Feakes is a senior career officer with the Department of Foreign Affairs and Trade (DFAT) and was most recently High Commissioner to Kenya. Other overseas posts he has served at include Lebanon, Jordan, Afghanistan, Solomon Islands, Papua New Guinea and the United States.